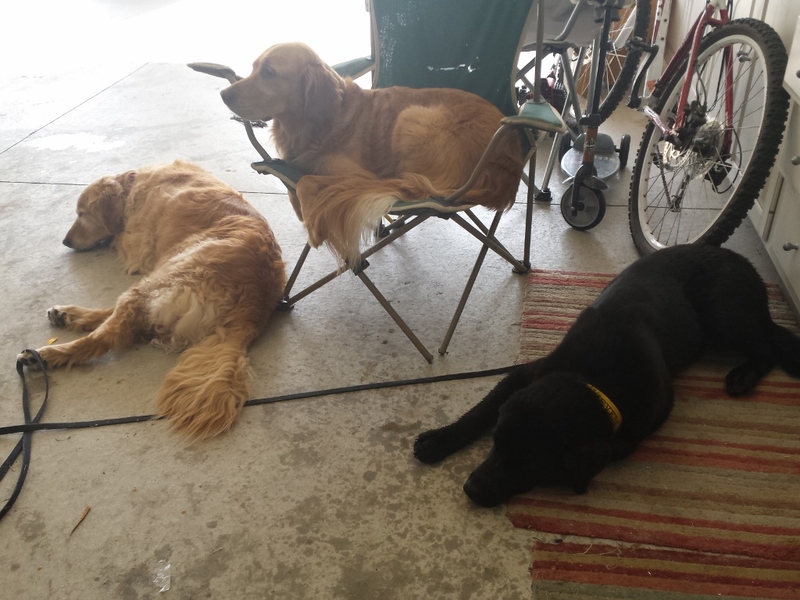 The Retrievers were first contacted by one of our Facebook fans about a dog, wondering if we could help. 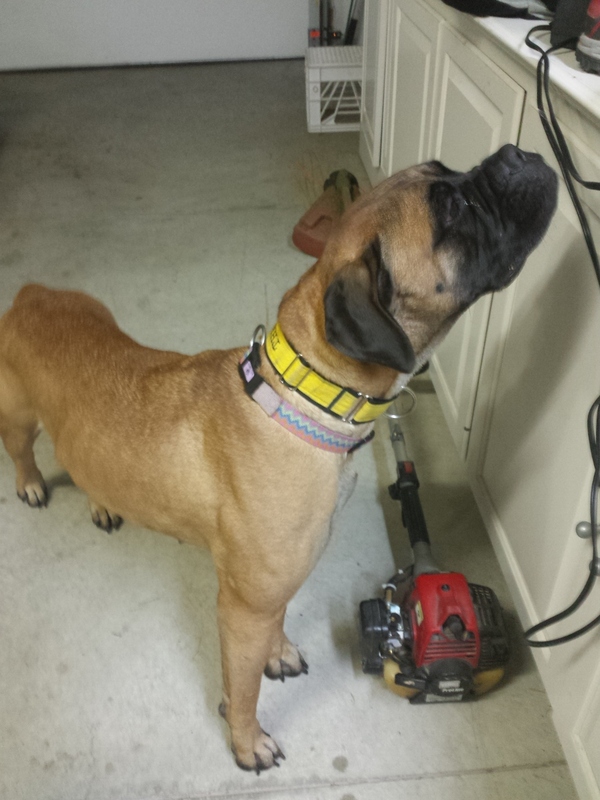 Molly the Mastiff had been vacationing in Northern MN with her family at a cabin and had gotten loose from her tie out. She was a former puppy mill girl who was skittish and was hesitant to approach anyone. 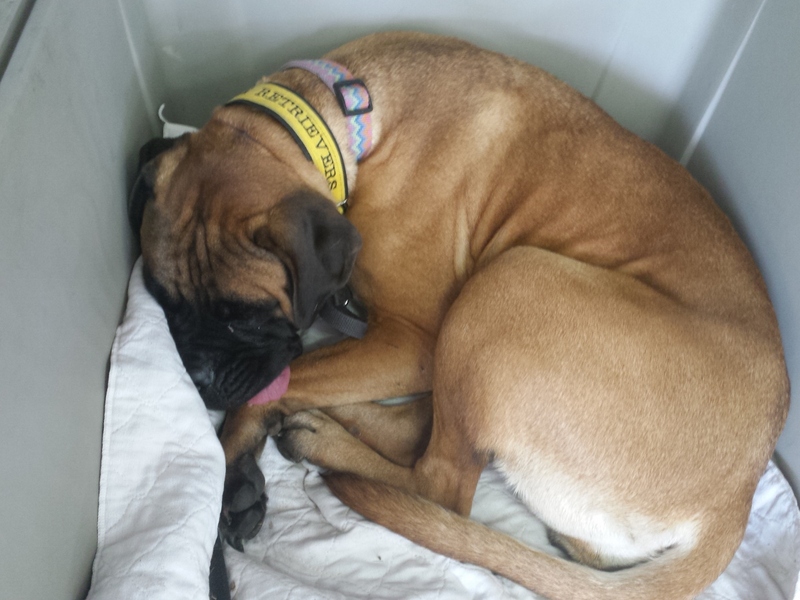 Per our request, Molly’s owners contacted us directly and we agreed to do our best to help her and them. Bobbi Jo from our team lives near the area and became the case manager. Molly’s owners who lived 4 hours away in the Twin Cities returned the following weekend to assist in getting awareness in the area. This was very important because soon after flyers were distributed to residents in the area of the point of flight and signs posted, the calls started coming in. Many had seen Molly and she appeared to be remaining in the area of the resort and golf course she took flight from. During the distribution of flyers to the area, Bobbi Jo (BJ) met a wonderful couple named Kathy and Tom, who lived nearby. They offered to help however they could in the mission to bring Molly home. 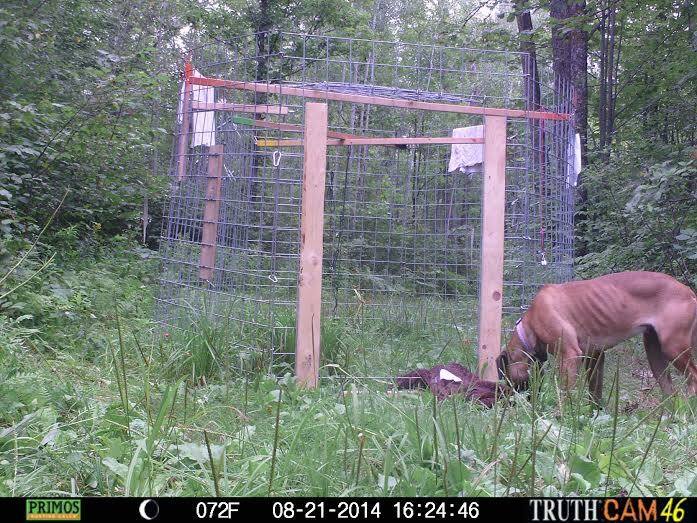 Based on reported sightings, BJ and Kathy set up a feeding/water station and a Missy Trap in a secluded area nearby. It was their hope that Missy would catch scent of the food and grow accustom to feeding there. 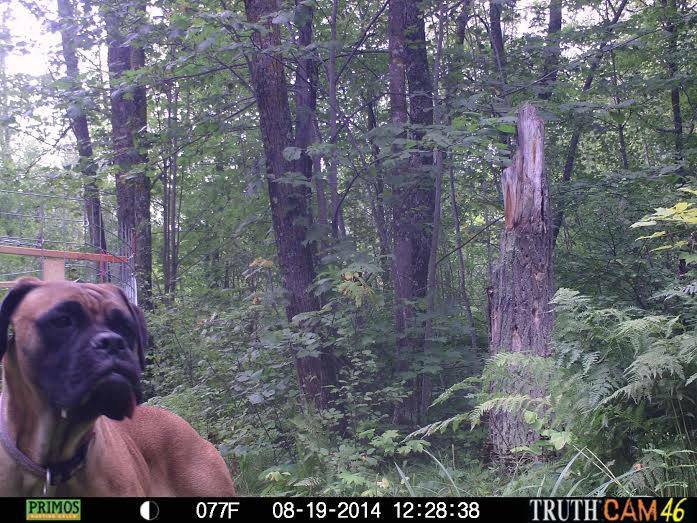 BJ also set up a trail camera to confirm that it was Molly that would be visiting and eating from the feeding station. The Trap was set up, but the gate was locked open. This would allow Molly to gain comfort in entering and leaving the trap at will for food and water, so when the time came to catch her, she would not hesitate to go into the trap. BJ and Kathy diligently kept the food and water stocked and after two nights, they finally had a sign. A picture of Molly standing right in front of the camera. She had found the food and trap. For the next few days and nights Molly visited at all hours and would often linger around for up to 90 minutes. Her owner’s clothing with their scent was hanging on the trap and Molly’s blanket was also in the trap. We feel she felt comfort in the scents and that is why she lingered for long periods. The time was right for capture. That Friday I drove up from the Twin Cities. I brought our Sensor/Magnet set up and our deep cell marine battery. The location of the trap was in the remote forested area and the battery could be used to power the sensor/magnet if a vehicle to power them was not available. We set up the sensor/magnet/battery and armed the trap ready for capture. We also set up our two Cellular Trail Cameras. If we did not capture Molly in the daylight hours, there was no way we would see if she was near the trap because it was pitch black with zero light out there after dark. 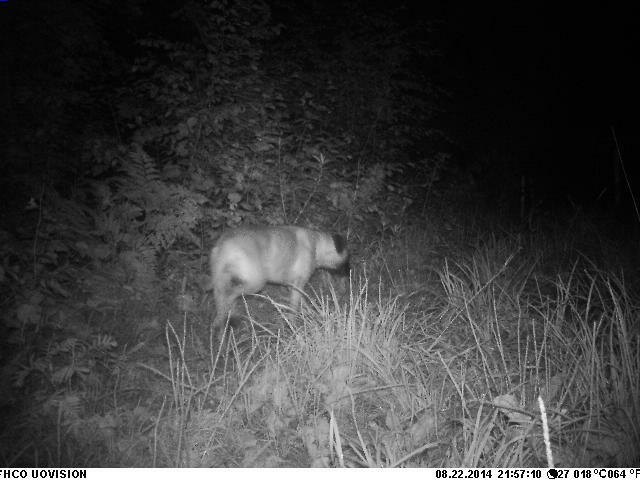 We set up camera 1 about 40-50 feet from the trap, on the trail she had been using to get to the trap. 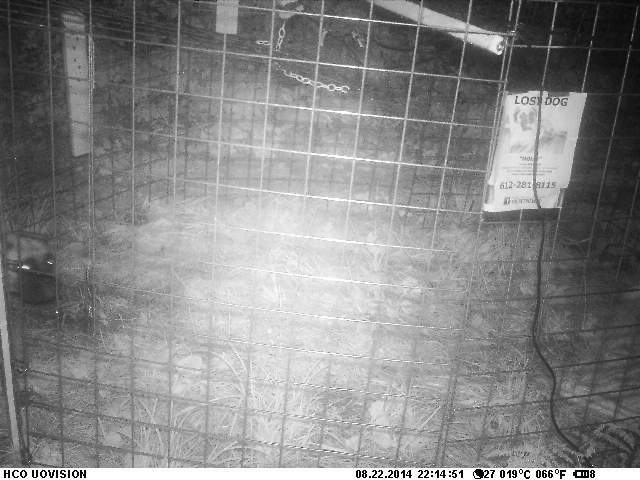 A picture sent from this camera would alert us that she was on her way and approaching the trap. 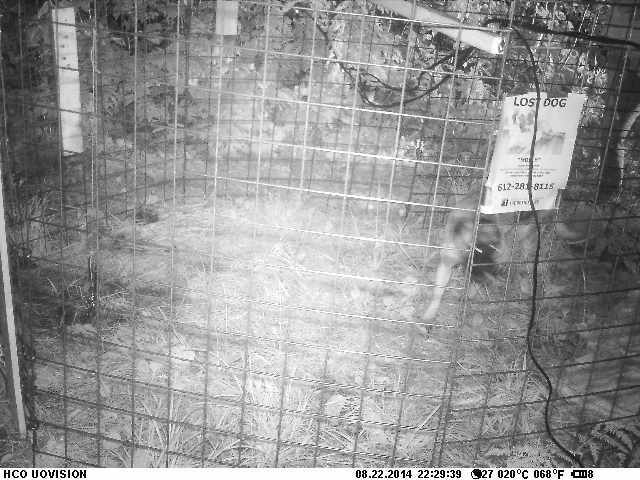 The other Cellular camera was aimed right at the trap so we could watch her in almost real time while she lingered around the trap. We also had two regular trail cameras set up near the trap just to capture as many photos of the capture as we could. We waited for a few hours. Some rain showers hit us off and on and there was no sign of Molly before it got dark. At that point we were blind and relying on the cameras and listening for the noise of the gate to close…. At approximately 9:45pm, Camera 1 sent us a photo. It was Molly and she was approaching the trap! Shortly there after, Camera 2 starting sending photos and we could see the red lights of one of the regular cameras turning on and off. Molly was at the trap and was lingering and taking her time to go in. BJ, Kathy and I were sitting in my jeep about 50 feet from the trap and we suspect she saw my jeep and was weary of the new element near the trap. As we sat on pins and needles in the jeep whispering and waiting, at 10:30 we heard it. The gate had closed! I turned on the headlights and Molly was captured in the trap! Molly stayed with me until the following afternoon when she was reunited with her dad. 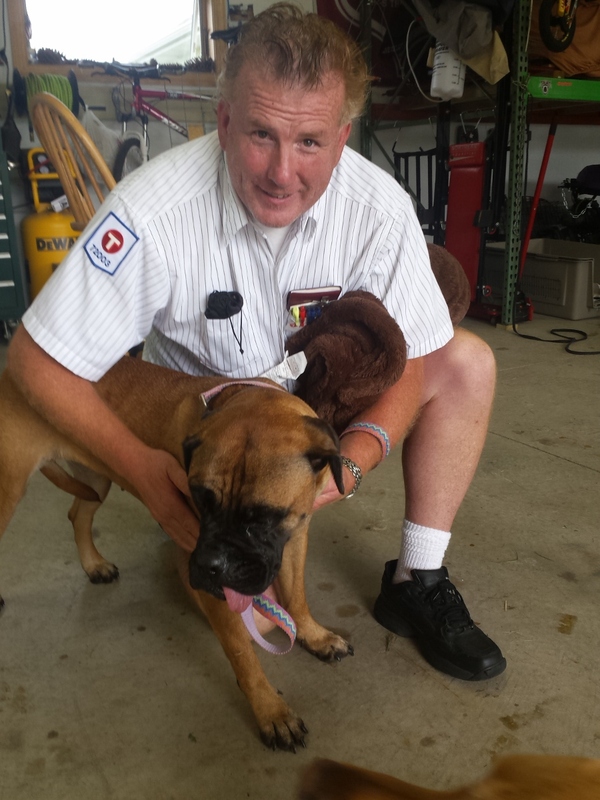 Molly the Mastiff is now safely back home with her loving family. 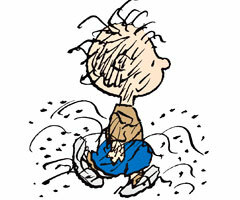 Pig-Pen’s got nothing on us. We all shed about 40,000 raft every minute. Hey, Retrievers fans! I wanted to take a moment to correct some misinformation that’s been going around the interwebs–sometimes shared by very credible sites, but it’s wrong nonetheless. It has to do with lost dogs and human scent. Here’s what you should know. So unless you’re dressed in a haz mat suit while setting up a trap or feeding station, you WILL leave your scent there. You’ll leave your scent when you walk away. It does no good to spray Pam on a trap. In fact, that would just make the metal sticky and cause MORE raft to collect on it. Experienced handlers of tracking dogs also say there’s no product that will effectively mask human scent (and you can bet plenty of fugitives have tried!). So, what does this mean for lost dog searches? Simply understand that that skittish dogs will weigh their fear of humans with their need for food. They may detect that a human being has been at a feeding station or trap, but then, there’s a hank of roast beef there NOW. Would a dog rather starve than approach an area that has “was-there-but-not-there-now” human scent? Not likely, IMO. There’s no need for Pam, and scent blocker is a waste of money. Just trust in a lost dog’s survival instincts. Put good-smelling food in front of them and let nature take its course. 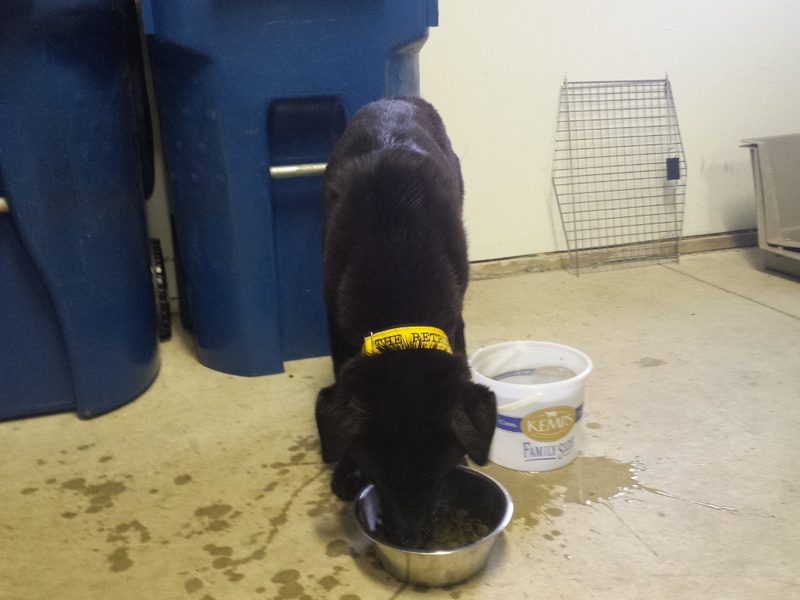 Retriever Bobbi Jo was contacted by a resident of her hometown in northern Minnesota about a black dog that had been hanging out near his business on the outskirts of town. The dog appeared to be young and limping. He was black and very skittish and would not let the man get near him. Bobbi Jo had recent experience in the same town in capturing two goldendoodles (see that story here), and she jumped into action. 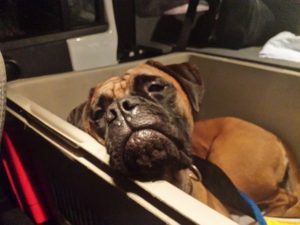 Bobbi Jo (BJ) immediately got awareness to the various outlets and authorities in hopes someone would come forward claiming to have lost the dog. That never happened so we assume the dog had been dumped to fend for itself. At the same time, BJ set up a feeding station in a secluded area of the property near where the dog had been seen. 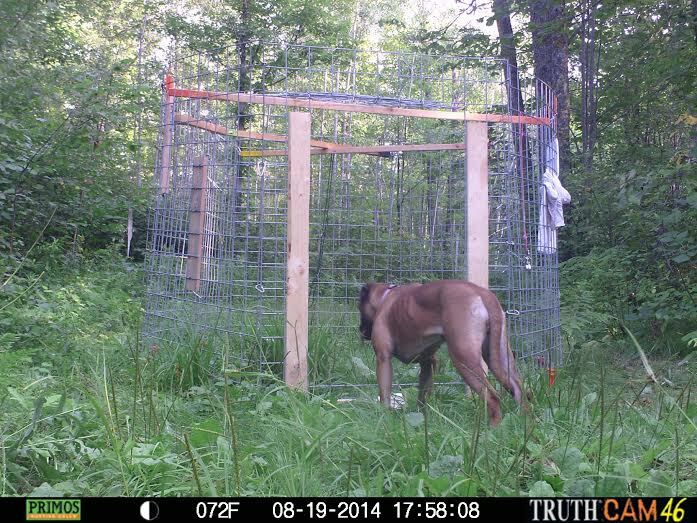 She also set up a trail camera to get pics of the dog using the food/water station and she set up a wire kennel as shelter for the dog and to get it comfortable with entering an enclosure and to prepare him for capture in the trap. For two weeks, each day BJ would stop by a few times a day to restock the food and water and check the camera. 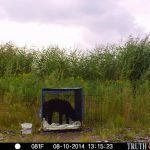 The dog was staying in the area, eating from the feeding station and better yet, was feeding from inside the wire kennel. The time was right to set up the trap for capture. I drove up the four hours on a Friday and BJ and I quickly set up a new trap we have. 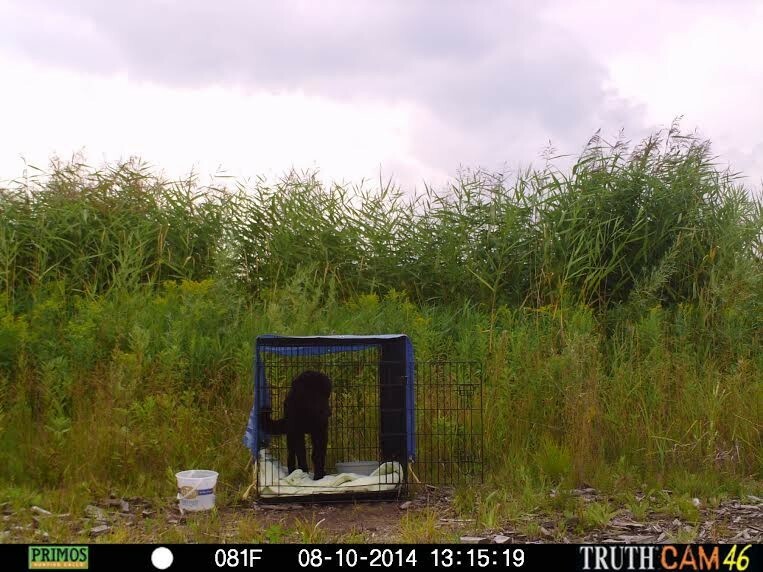 A Retriever fan had graciously donated a Great Dane sized wire kennel that I converted to use as a trap with our sensor/magnet set up. We felt a Missy Trap was not needed (but I did bring one with just in case). We set the trap near where the feeding station was and then ran the 200 feet of wire to my jeep which was parked a distance away behind some tall grass. We decided to forego the sensor because we planned to manually kill power to the magnet from my jeep when the dog entered. We sat and we waited. We waited a short 45 minutes before the dog emerged from the tall grass and approached the feeding station area. He first knew something was different and watched my jeep from the area. He did a lap around the wire kennel. He then walked over to the trap and his hunger overcame his caution and he walked right into the trap for the food. 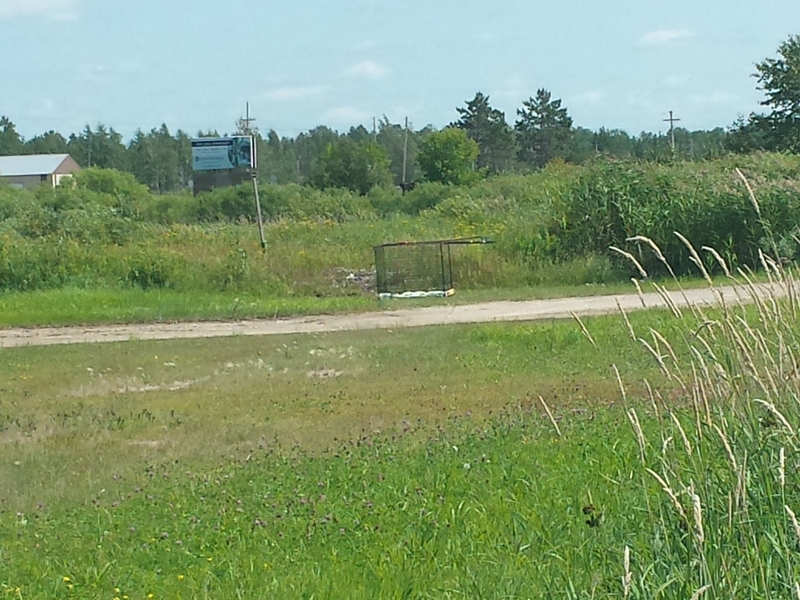 We pulled the plug and the gate closed. He was safely captured. We did not confirm he was a boy until we calmly approached the trap. He was a bit frightened/overwhelmed and peed, but we also confirmed him to be young. Our guess was 6-7 months old. After a couple minutes he was gently taking treats from BJ by hand and was already a sweet boy. It was a hot and sunny day so we covered the top of the trap with a blanket to shade him. We decided to name him Cash because his coat was all black and he was a surviving rebel like Johnny Cash. We checked Cash for a microchip and there was none. We loaded up the trap equipment and Cash into my jeep and then the trap itself onto the cargo carrier. It was time to hit the road back home with Cash who would spend a couple nights with me until he went to rescue. He slept all the way home in the cool AC of the jeep. In the 48 hours I spent with Cash, I learned that he was a very, very sweet boy and just wanted to be a happy puppy and play with my two goldens. 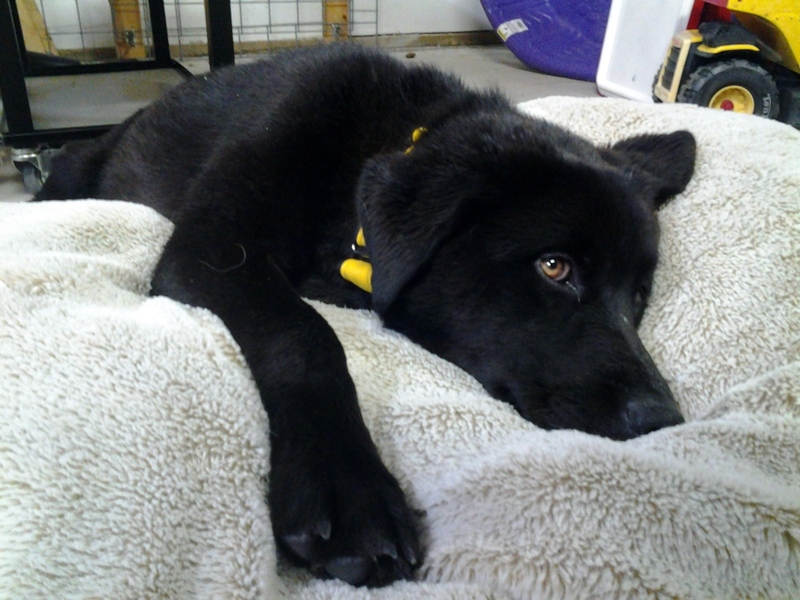 On Sunday he was transferred to Fargo, ND to be fostered by 4 Luv of Dog Rescue. At the time of this posting he is currently up for adoption. 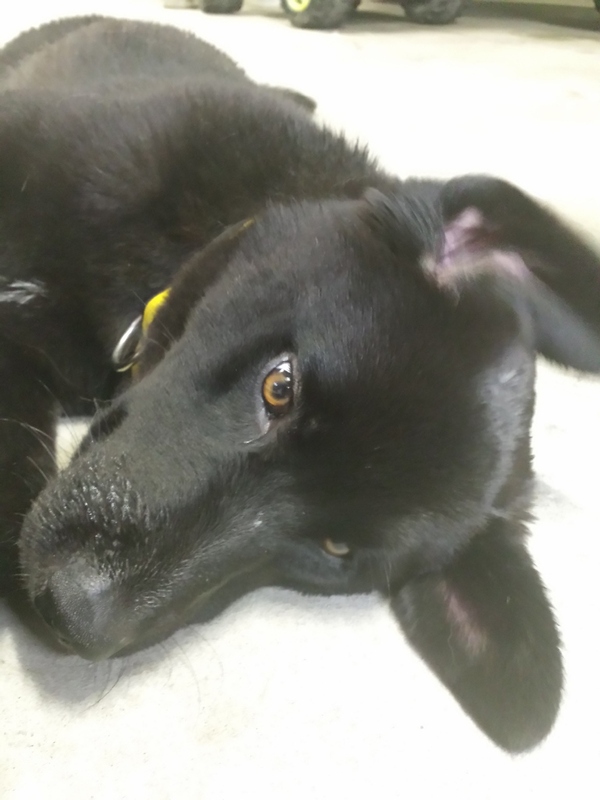 We’re told he did well at his initial vet visit and is estimated to be 10-12 months old and his limp was from anaplasmosis, a tick borne disease. Antibiotics will rid him of that. 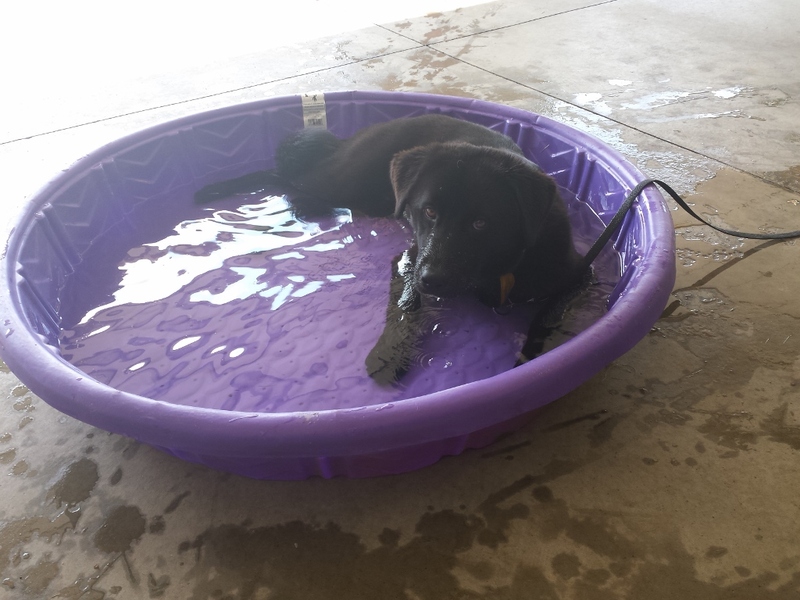 A special thank you goes out to 4 Luv of Dogs Rescue for taking Cash into foster. They already had a Cash in foster so we decided to change the name of our Cash to Lucky. They will find Lucky a wonderful family and that family will be very lucky to have Lucky. 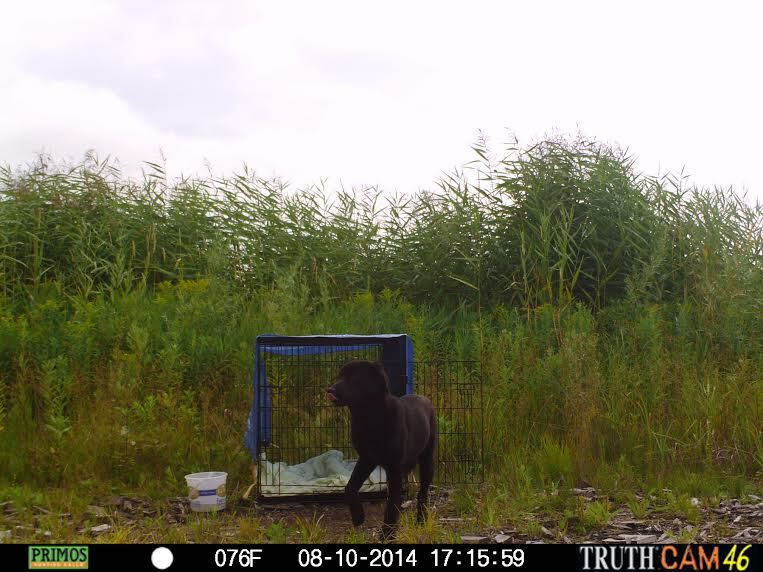 The plan from the start, to capture Lucky, was executed perfectly by Retriever Bobbi Jo. Once again, she did a fantastic job in helping this dog and saving him. Good luck and best wishes on a great life, Lucky. Here’s a video of the capture shot from 200 feet away. 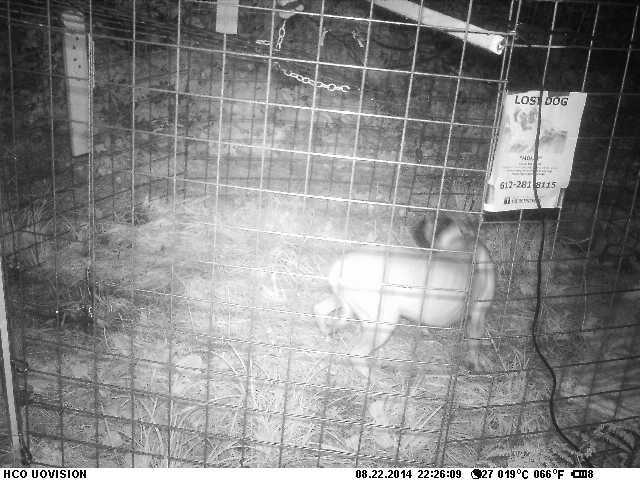 Last week, we were thrilled to hear from a group in New York who had used our Missy Trap design to capture a hard-to-catch dog. They generously shared hundreds of photos from their trailcam so we could make this video to post on our Facebook page and website. We’re so happy to have been a part of their success in bringing Armie safely home.